Looking for the perfect personal gift idea for someone with a beloved pet? Look no further. A fully custom portrait illustration is totally unique and will be treasured forever! Both Printed & Printable options are available. 2. Send a convo message with the breed (if known) and a photo(s) of the pet to be included. Please specify if you have any special requests. 4. When you tell me you love it, printing begins, and a print will be shipped to you. If you've chosen a Digital version, a print-ready PDF will be emailed. 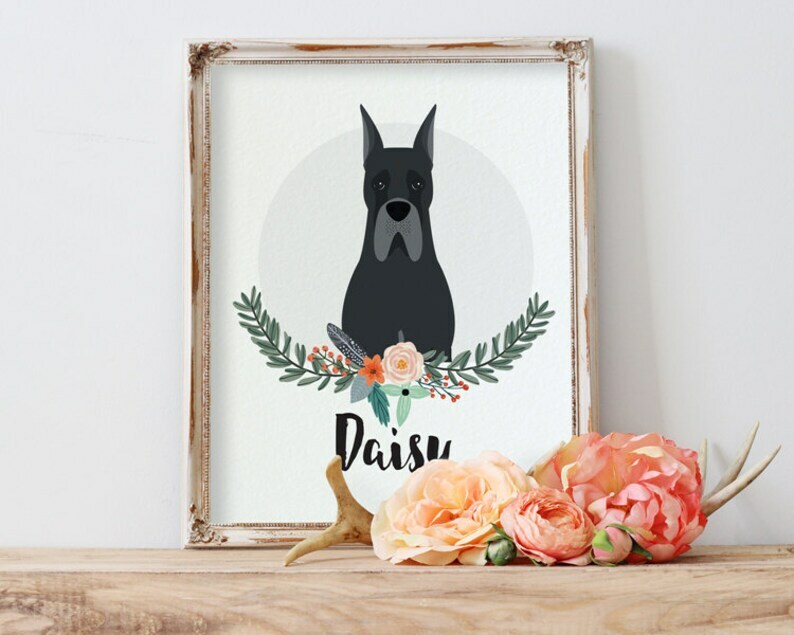 ***Note: While these portraits are totally custom and meant to look like the animal pictured specifically based on their appearance attributes, they are only intended to be whimsical likenesses of them as an affordable alternative to realistic portraiture. HOW MANY PETS CAN I INCLUDE? CAN I ADD A PERSON? Yes! Simply choose that option from the drop-down menu. So in love with these custom bags for our wedding! Highly recommend! Picture turned out great! Pup looked just like pup in real life. Great communication and customer service!